It's not until you plan to wear a strapless wedding dress that you realize how much sun exposure you get on a daily basis. Once you start to see you are headed towards an unflattering farmer's tan then you begin to look for products containing SPF without the overpowering smell of sunscreen. Here's what I found in my search for a daily lotion containing SPF. First, the all over lotion... There aren't a huge variety of lotions with SPF. At the local drug store I found two brands, Eucerin and Aveeno. As the Eucerin bottle was huge and the lotion I had used from them for my excema as a child was a bit greasy, I tried out the Aveeno daily moisturizing lotion with sunscreen. (I've had good luck with Aveeno baby oatmeal soothing lotion for itchy skin so I thought this would be a good choice.) It contains SPF 15 and doesn't wreak of sunscreen. It's not too greasy and it absorbs into your skin quite well. Next I went looking for a daily lotion for my face with SPF. See a couple years ago I switched to mineral powder makeup for the days that I wore makeup. Before then I would use a liquid foundation from either Clinique or Mary Kay. The liquid was perfect as it hid my blemishes and also protected my skin from the sun. Unfortunately I dated a guy who liked me without makeup and now I'm too lazy to apply a foundation everyday again. So days I remember, I put the mineral powder on but it unfortunately is just that. A powder... so it doesn't block much by way of UV. This realization led to a purchase a year or so back. 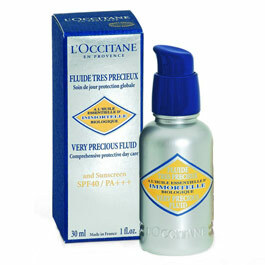 I spent the extra cash for a little bottle of magic from L'Occitane called Immortelle Very Precious Fluid SPF 40. You apply it on top of the moisturizer you wear each day and besides offering UV protection, it's also said to brighten your face and even out pigment tones. As I've just found it again after a year, I can't say that I know if it really works. But I'm going to give it a try and let you all know. So those are just two products from my anti-sun arsenal to keep from uneven tanning and loosing my beautiful porcelain skin. Anyone else find the desire to protect your skin from daily sun exposure due to not wanting a farmer's tan as well?